Eddie MacDonald returned to Seekonk Speedway on Wednesday, July 19 after a one week rain delay to score a fourth place finish in the $10,000 to win U.S. Pro Stock/SLM National Championship. The Rowley, Mass. driver had the taste of a win only to be denied when the right front tire began to lose pressure with 25 laps to go in the 200 lap feature. SEEKONK, Mass. 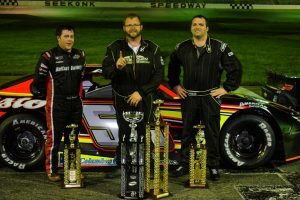 – Seekonk Speedway regular David Darling captured his first career Granite State Pro Stock Series win on Saturday night. At his home track of Seekonk, Darling dominated the inaugural 100 lap main event on the third-mile oval and wheeled the Bristol Toyota No. 52 into Victory Lane. The victory was his third of the season at Seekonk overall — he had won two of the weekly shows before invading on the GSPSS Saturday night. Seekonk, Mass. – New England Race Promoter Gary Sagar of Kraze Korlacki Speed Equipment has announced, the addition of two more race venues that will host guaranteed starter races for this summers U.S. 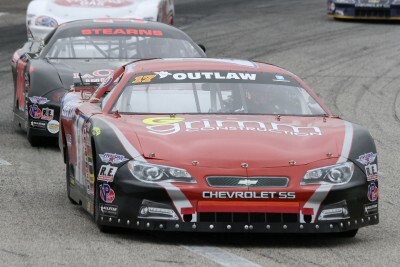 Pro Stock/Super Late Model National Championship Race, at Seekonk Speedway, Seekonk, MA. The 2nd annual 200-lap race, on Wednesday July 12, will pay $10,000 to the winner. Track Manager Joe Bassett welcomes the opportunity making the April 30th date with the Granite State Pro Stocks in town, the first guaranteed starter opportunity. WALPOLE, N.H. – Even though the 2016 Granite State Pro Stock Series season finished just a few weeks ago at New London-Waterford Speedbowl, the GSPSS is already looking ahead to the 2017 campaign. And with that, the series is proud to announce the first scheduled race for next season at Seekonk Speedway in Seekonk, Mass. The inaugural Seekonk 100 will take place on Saturday night June 24, 2017. 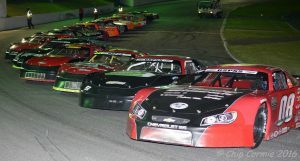 Waterbury, VT – The 2016 American Canadian Tour (ACT) Late Models of New England head to the famous “Cement Palace” that the Venditti family has owned and operated for over six decades. This Saturday night, July 16, a 150-lap ACT Triple Header, round two event, will be contested with the best of the ACT competitors and the weekly racers from Seekonk, Waterford Speedbowl, and Thompson Speedway. The first of the three Triple Header events was won in a run-away by Joey Polewarczyk, Jr. (Pole) at the Waterford Speedbowl in May. He also won his first race, and the last ACT race held at Seekonk, in 2007. He looks to become the spoiler in his limited schedule of 2016 events this Saturday night. “It is a different mind-set when you are not in a title battle. Our team just has to concentrate on winning the race and not worry about the championship points. I miss the competition for winning titles, but after over a decade of chasing point standings, this is kind of fun just running for the wins. I just don’t want to upset what has turned out to be a very competitive title run for four or five teams, so that puts a little added pressure on us to try and get clear of their track action if possible,” said Pole.